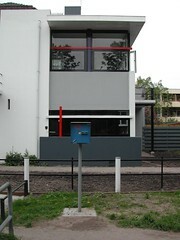 A visit to the Rietveld Schröder House remains a fascinating experience. 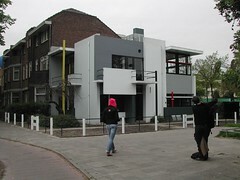 This house is the only building ever realized on the basis of the architectural principles of De Stijl. Typical features are the use of the Stijl colours red, blue and yellow, in combination with white, grey and black, the relation between interior and exterior and the unity between the free-standing pieces of furniture and the fitted parts of the interior. According to Rietveld and Schröder one had to have an active attitude to life. For them too living in a home is a conscious act. The furnishing of the house reflects this conviction. The occupant has to perform a transaction for every activity: the bathroom is created by opening out a wall, while the sleeping areas could be screened off with sliding walls, and privacy was obtained by placing shutters in front of the windows. The house is literally a machine for living in.